A 19-year-old San Luis Obispo man stole a tip jar from a Paso Robles business in order to pay back his drug dealer, the suspect told police. The approximately $27 that was in the tip jar were not recovered, according to the Paso Robles Police Department. But, officers did seize a small amount of heroin when they tracked down the suspect. On Wednesday, police responded to a report of a theft at a business in the 800 block of 11th Street. The store clerk told officers that a white male adult stole the tip jar from the counter area of the store and then fled toward Spring Street. Police did not succeed in finding the suspect during their initial search. About 15 minutes later, the clerk called police and said she saw the suspect in the area again. The store owner then chased the suspect until losing him near the train station on Pine Street. Officers arrived again and found the suspect on the train loading platform. Police identified the man as Joseph Jeffrey Mikkelsen and determined he stole the tip jar. 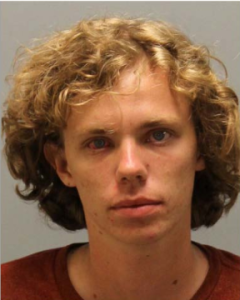 Mikkelsen was on probation for grand theft in San Luis Obispo County, according to Paso Robles police. In addition to finding heroin, officers also found needles in Mikkelsen’s possession. Police determined Mikkelsen was under the influence of a controlled substance. Officers arrested Mikkelsen and booked him in San Luis Obispo County Jail on charges of shoplifting, violation of probation, possession of a controlled substance and being under the influence of a controlled substance. A police department news release did not state whether the jar that contained the tips was recovered. SLO county jail would not be a fun place to work. Detoxing patients, being overflowing with prison re-alignment overflow. . This guy will probably be sick and withdrawing REAL soon. What a shame these youth are getting themselves addicted to opiates like oxycontin, heroin. It literally takes over their lives. So sad. I hear from young people sometimes how common heroin is these days in this area (they sometimes get these batches that are much stronger or are cut with Fentanyl). We used to have a really healthy fear of heroin when I was a teen and young adult—and it was very difficult to “score”. If the supply is there—it certainly ups the odds kids might give it a try. And that is where the “healthy fear” comes in. We knew as teens it was a one-way ticket to hell. What was that Joni Mitchell song…. I’ll be darned….a young white male. Time to build a wall. As true Christians know, this fool named Joseph Jeffrey Mikkelsen will NOT be in our glorious heaven. We can thank our Hebrew God’s absolute word on this fact. “Nor thieves, nor the greedy, nor drunkards, nor revilers, nor swindlers will inherit the kingdom of God” (1 Corinthians 6:10). Upon Judgment Day, we Christians can look down upon Jeffrey and gain solace as he burns in the sulfur lakes of hell for eternity as Jesus posits in the following passage, praise! Are you saying that the bible contradicts itself? The 1 Corinthians 6:10 passage is in an absolute sense, “nor thieves” will enter the kingdom of God. Now you proffer a contradicting passage that through godly sorrow works repentence to salvation. Which passage is true? Both passages that are contradicting cannot be true at the same time. Think of this notion, Hell exists as shown in many bible passages, therefore, it has to be used for the purpose of why it was created in fear. Therefore, if everyone is repented, then there is no use for Hell and it was crearted all for naught. Get it? In any event, Jeffrey will be getting an E-ticket slide ride to the depths of Hell upon his demise, praise!